16-bit music or 64-bit music, no 8-bit music! Dang what do you have against 8-bit? Last view: 85 days 16-bit and 64-bit just age better for me! Last view: 85 days No Dani the N64 uses 64-bit quality but it’s rival the PS1 uses 32-bit quality. N64 sound is very interesting; it was actually generated by the "reality coprocessor", which is also the GPU. So it is actually being generated by a 64-bit machine... (Though the N64's main MIPS processor was capable of 64-bit processing, it pretty much always ran in 32-bit mode in most games for faster operation) I guess 64-bit sound isn't a terrible description. 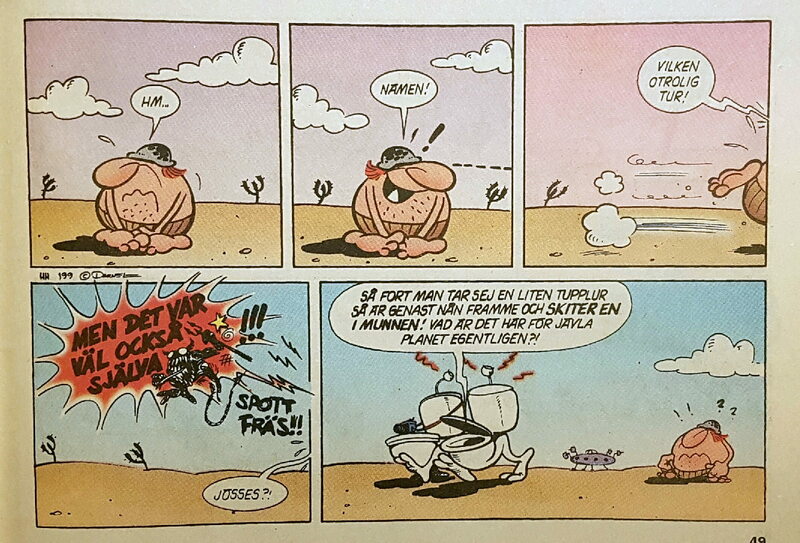 Some fun for those of you who can read swedish. Which is like...2 of us here? Leave it to Kafuka to bring multicultural enrichment to my life. Heh, trying to find a toilet in the desert can be annoying? Last view: 85 days Right, I was thinking the same thing! But Trapster can you please shrink your image please, thanks. That's quite the funny comic! Also now I know that aliens are toilets. Last view: 85 days It wouldn’t matter anyway, there’s no police station for miles. Last view: 85 days But think about the fruit bats though! Mavis? As in that redneck character from All That? MySQL - queries: 211, rows: 636/669, time: 0.198 seconds.